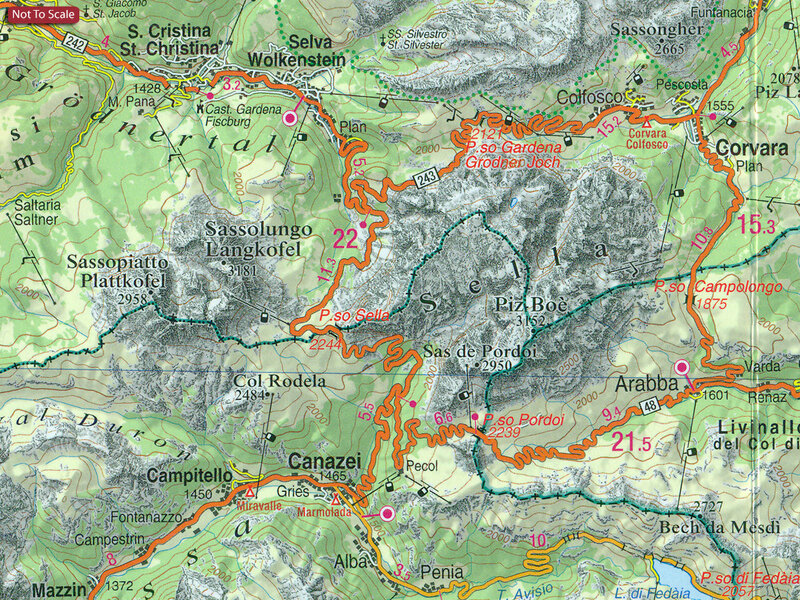 The South Tyrol region of north-eastern Italy on a durable, waterproof and tear-resistant road map at 1:160,000 from Tabacco with excellent presentation of the topography derived from the publishers’ highly regarded and popular hiking maps, plus on the reverse a panorama drawing of the mountains. 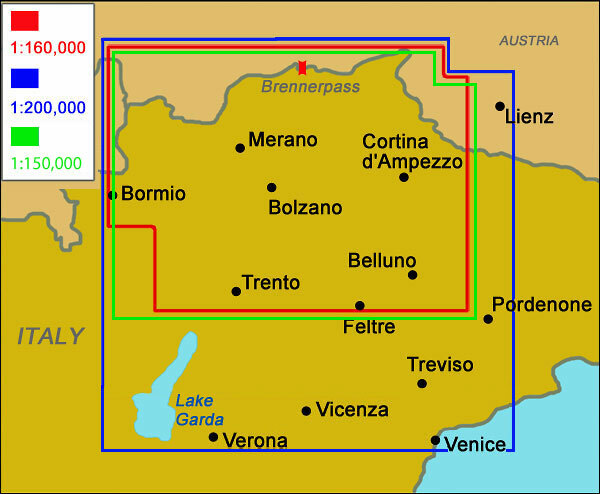 Coverage extends from the Austrian border to just past Trento and Feltre, and west/east from Bormio to well east of Belluno. 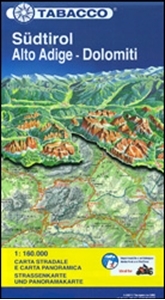 The map provides a very clear picture of the region’s landscape through graphic relief for its exposed rocky areas, plus relief shading and contours at 100m intervals, and has plenty of names of individual groups, peaks, valleys, etc. Additional colouring indicates woodlands and boundaries of national parks and other protected areas are marked. Minor roads are drawn without generalizing their course, showing the twists and turns across the mountainous terrain. Driving distances are marked on main and many connecting routes. Railway lines are shown with stations and mountain transport lines (cable car lines, chair lifts, etc) are included. The map is designed to present the topography of the region rather than its tourist sights, but it does indicate campsites. Latitude and longitude lines are drawn at 10’ and 20’ respectively. Where appropriate, both Italian and German place names are given. Map legend includes English. 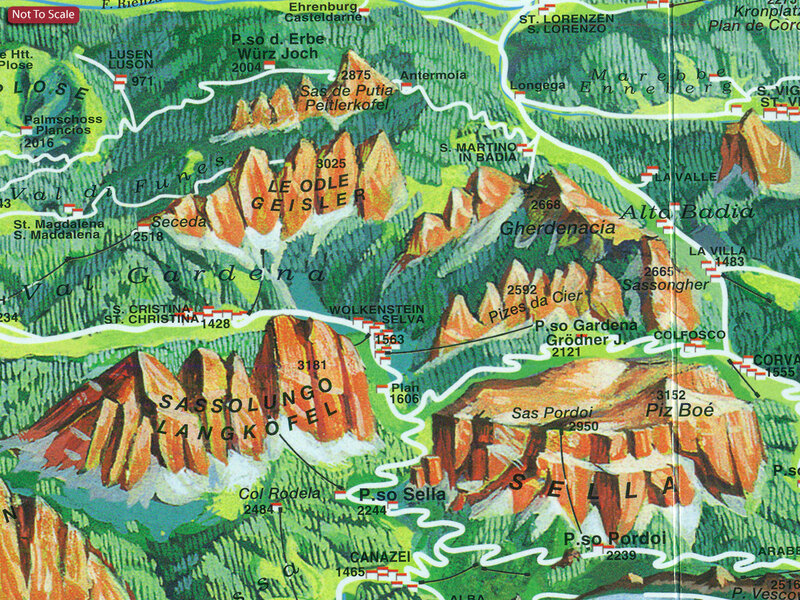 On the reverse is a panorama drawing of the Dolomites, looking northwards from the Po plain and the motorway linking Lake Garda and Venice, with the Austrian and German Alps in the background. Annotated with names of mountain ranges, peaks, valleys, etc, the panorama also shows local town and villages and the region’s road network.